Big data is transforming the world of governance, risk management, and compliance (GRC). 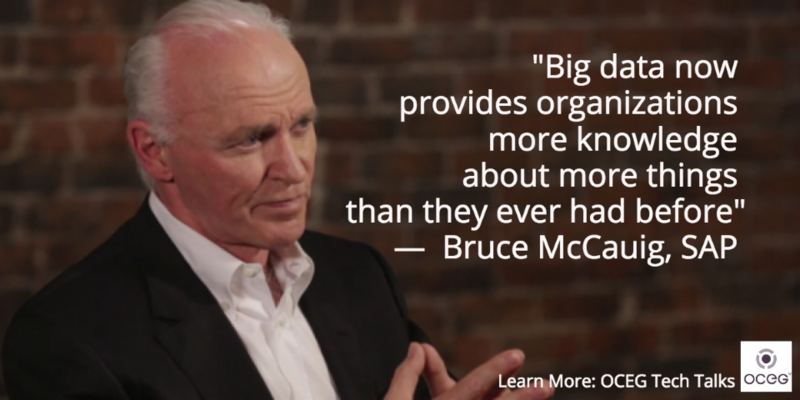 In the Tech Talk video interview Big Data and GRC, Bruce McCauig, Director of Solution Marketing for SAP, shares thoughtful stories from his experience as a chief auditor, global consultant, and board member. He also talks about exciting big data technology solutions from SAP. In one of many examples, Bruce tells of a proof of concept project with a global client. The client wanted to find out if they had made duplicate payments. They operated in many countries, with many currencies and data centers. In just a few minutes, using SAP’s HANA technologies, they were able to review millions of transactions, collected over six years, to identify a few dozen duplicate payments. This task (if undertaken at all) would have taken months to complete before big data technologies. Stay informed and watch the full hour-long video or select by topic from 17 short videos. “Big Data and GRC,” is part of OCEG’s Tech Talk Series. The online videos explore GRC technology through interviews with solution experts. Visit the full series listing for more information.